Are Americans Finding Love in the Grocery Store? ALDI fans know how it feels to fall in love in our aisles—who wouldn’t go heart-eyed over delicious products at such low prices? But this Valentine’s Day, we wanted to explore another kind of love connection. 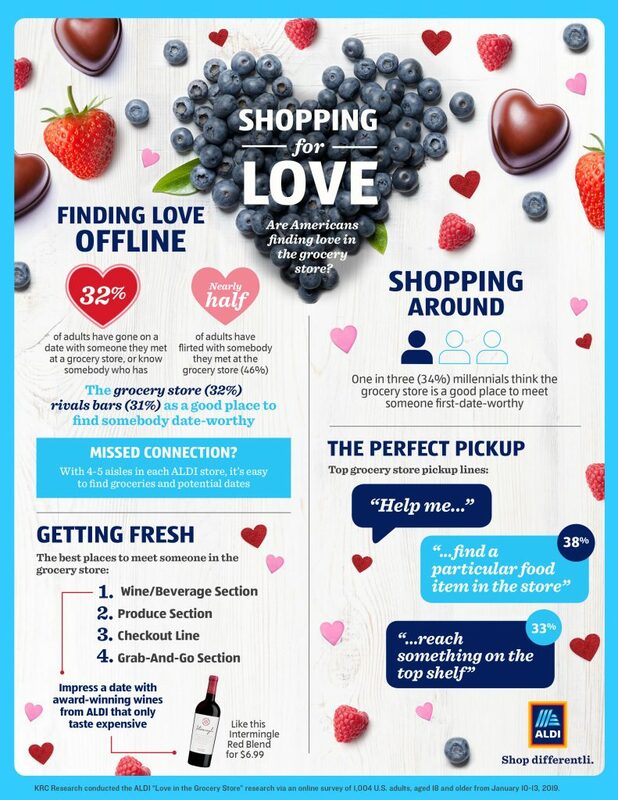 We surveyed more than 1,000 U.S. adults to learn just how likely they are to find “the one” while shopping at the grocery store. Turns out, the odds of bumping into your Romeo or Juliet in the ALDI aisles are higher than you might think. Nearly one in three adults have gone on a date with someone they met at a grocery store, or know somebody who has. Need more convincing? Check out the stats below, and then head to ALDI…you never know who you might meet while picking out a perfect piece of produce. P.S. If you’re putting together your shopping list for a romantic date night in, don’t miss our Specially Selected gourmet snacks and chocolates, award-winning cheeses and wines – including our Intermingle Red Blend or Petit Chocolat Wine Specialty- and fresh flowers. P.S.S. Remember this adorable couple? Comment below if you’re looking to make ALDI the backdrop to your engagement photo shoot. Hi was just wondering if you were going to have the advent calendars again this year the wine and cheese and if we can purchase them on line? We can’t confirm at this time, but if we do they will be in store only and not available online. Today in Aldi’s I found a man in a jacket that said “Store Manager” and asked him if the store would be getting the same German chocolate for Easter that they sold at Christmas time, the chocolate that came in bags with Santas and Christmas ornaments. He answered me, “No, we won’t be getting Santa chocolates on Easter.” What a jerk. He knew I was asking about the chocolate, not the form. So I politely clarified, “I mean the same German chocolate, do you get it for other holidays?” He snapped back, “We never know what we are getting till it gets here.” I rarely shop at Aldi’s and this was my first time speaking to an Aldi’s manager. I have never ever been spoken to by a manager so rudely at Wegmans, Tops, Price Rite, or Trader Joe’s. Is nastiness to customers tolerated here? Hi, I went five times to my local Aldi grocery store, to pick up the heart three cheese special you had for Valentine’s Day. First time the person there knew nothing about it, I showed her the store aid paper, she still had no knowledge. Then finally said the delivery had been slow, check back in a couple of days. I did two days later…at first I walk around picking up items I like there, went up to a store staff, and again didn’t know what I was talking about. I ended up walking around some more and found one of the store staff bring in items to put out. Asked him, he showed me where it should be, which I knew where…and the proceeded to say I guess it still hasn’t been delivered. So again I waited another two days and nothing…the fourth time I called…and the young lady knew nothing about the special three heart cheese. My question is, did you ever get the special three cheese heart or not..
We’re sorry about the frustration. The stores did receive the cheeses. Some did get them a bit late due to logisitical issues. These will be available for our German Week starting 3/20. Hi I would like to know if Aldi will be getting Fusia wonton chicken or pork soup bowls in again. Love it for lunch at work so easy to make in microwave at work. We don’t have any plans at the moment but that can always change!